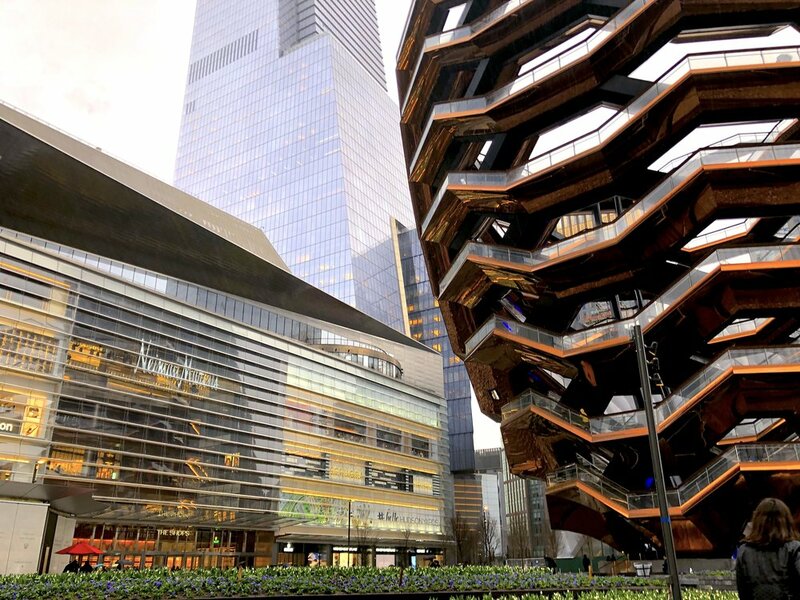 Last week, Hudson Yards made its grand debut, and according to the website, has hopes of being New York’s newest go-to neighborhood for diverse shops, food, offices, public art, plazas, and residences. Located between 10th and 12th Ave. in Chelsea, the mall features connections to commuter rail service, the subway, the West Side Highway, the Lincoln Tunnel and ferries along the Hudson River. The development is placed around an assortment of chic art galleries, inviting restaurants and bars, the High Line, and now, a new public square and gardens. With its unique architectural design, Hudson Yards is quickly becoming a popular “Instagrammable” spot. Thomas Heatherwick developed “the Vessel,” and the New York Post describes it as an “Instagram-worthy exterior undersides polished to a mirror-like copper sheen contrasted with black and red details on the interconnected staircases.” The Vessel in Hudson Yards may quickly become the most photographed spot of 2019. Costing more than $20 billion to build, Hudson Yards mall was reportedly conceived nearly two decades ago. However, the newest collection of shopping centers, restaurants, apartments and office buildings on Manhattan’s west side has made its debut. The question on many shoppers’ minds relates back to one thing: you may enjoy the mall if you can afford to shop there. A college student on a budget may feel similar to Davidson when it comes to the abundance of luxuries. For college students wondering if the mall is worth the visit, it varies based on individual budgets and tastes. Students searching to do some serious retail therapy may find that affordable prices at H&M and UNIQLO desirable. However, only a few floors up is the luxury goods store, Neiman Marcus. Showcasing Fendi and other high-end brands, the atmosphere precedes its reputation. For most, it may be easier to save the trip and simply shop online to find better deals and the convenience to fit in with schedules. For some, this new mall may be a unique outlet for different styles, options, food, and exploring. “I’m always going to want to go back to a physical store, and of course the convenience of having several stores together is just nice. But with this mall, in particular, most of the stores aren’t really meant to cater to those on a budget. So, more than fighting online shopping, I think the mall’s bigger challenge might be keeping customers even if they don’t want to spend a ton of money,” Cheney said. Hudson Yards is an experience for everyone to test out, and it is it a small world at the fingertips of New Yorkers and visitors alike.